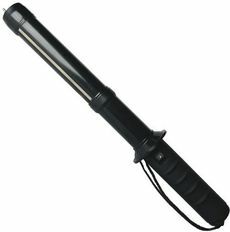 Because of their power and extended reach, Stun Master 300K Volt Stun Baton are a favorite among security guards. Simply touch an assailant with the baton and pull the trigger: three-to-five seconds will leave the assailant dazed and temporarily paralyzed. The baton will also deliver a shock when touched six inches from the tip, to prevent an assailant from taking it away. Rubber handle. 16" in length. Powered by two 9-volt Energizer Eveready alkaline batteries (not included). Lifetime Warranty.